With Madcap Comedy "His Girl Friday"
Trinity Rep in Providence will open its 2011-2012 Season on September 9 with the screwball comedy "His Girl Friday." Playwright John Guare’s new adaptation of the time-honored favorite by Ben Hecht and Charles MacArthur will be directed by Trinity's Artistic Director Curt Columbus. Performances run through October 9 in the Chace Theater. Resident acting company member Fred Sullivan, Jr. plays hard-boiled newspaper editor Walter Burns, who will stop at nothing to prevent his firebrand star journalist Hildy (Angela Brazil) -- who also happens to be his ex-wife -- from leaving the paper to get remarried. The stormy political underpinnings of 1930s Chicago provides the perfect plot for Walter to win Hildy back: he gets her to stay just a little bit longer with the promise of the scoop of a lifetime. When an escaped con makes his way from the courthouse to the court reporting pool, Hildy jumps at the chance to hide him in a roll-top desk until she can get to the bottom of the mess -- a murky conspiracy where an innocent man’s life hangs in the balance, depending not so much on the truth, but on unsavory politics. Curt Columbus sees Guare’s adaptation as an opportunity for Trinity Rep’s Tony Award-winning resident acting company to show its skills by staging "His Girl Friday" as a quick-change piece in which 11 actors bring twice as many roles to life on stage. He added that "His Girl Friday" examines America’s tormented relationship with truth, justice and the media. "The issues speak to our current moment -- an out-of-control media that will do anything to get a story, a corrupt political bureaucracy that will do or say anything to keep power, a world situation that unhinges even the calmest of world leaders. Yet they are also set against the backdrop of autumn 1939, the eve of World War II, and in the midst of that era’s economic crisis." The company also features Stephen Berenson, Janice Duclos, Phyllis Kay, Brian McEleney, Stephen Thorne, Richard Donelly and Brown / Trinity Rep MFA Program actors Philippe Bowgen, Brough Hansen, and Lovell Holder. John Guare has written such plays as "House of Blue Leaves," "Six Degrees of Separation," "Landscape of the Body," "A Few Stout Individuals," "Four Baboons Adoring the Sun," "A Free Man of Color," "Lydie Breeze; the screenplay" for Louis Malle's "Atlantic City;" and librettos for "Two Gentlemen of Verona" and "Sweet Smell of Success." 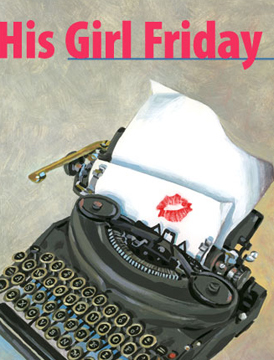 His adaptation of "His Girl Friday" premiered at London's National Theater. He has received Tony Awards and nominations, Academy Award nominations, Olivier and Drama Critics Circle Awards, the PEN/Laura Pels Master Dramatist Award, the Gold Medal in Drama from the American Academy of Arts and Letters, and the Obie Award for sustained excellence. The first performance on September 9 at 7:30 p.m. is Pay What You Can. Tickets go on sale that evening at 6:30 pm, with a limit of one ticket per person. Talkback sessions will be held after every performance; Audiences are invited to share their response to the play for approximately twenty minutes following the curtain. For information and tickets, visit the box office at 201 Washington Street in Providence, call 401-351-4242 or visit www.trinityrep.com.